Liberty Tree Tavern is an opening day restaurant located in Liberty Square in the Magic Kingdom. As it has been around since day one, this restaurant has a lot of nostalgic charm. In addition, it is perfectly themed to Liberty Square with its colonial American façade and décor inside. The different dining rooms inside are tributes to historical figures of the era: Paul Revere, Betsy Ross, Thomas Jefferson, etc. We had tickets to attend Mickey’s Very Christmas Party and wanted a hearty, sit down lunch since we knew we would eat a quick serve dinner to save as much time as possible for the party. This seemed like a perfect time to enjoy our first meal at Liberty Tree Tavern. We had my dad (aka Donald) with us for this meal. Here in our Liberty Tree Tavern Lunch review, we’ll examine the restaurants theme, atmosphere and food. As per usual, it will include a healthy dose of pictures of it all too! 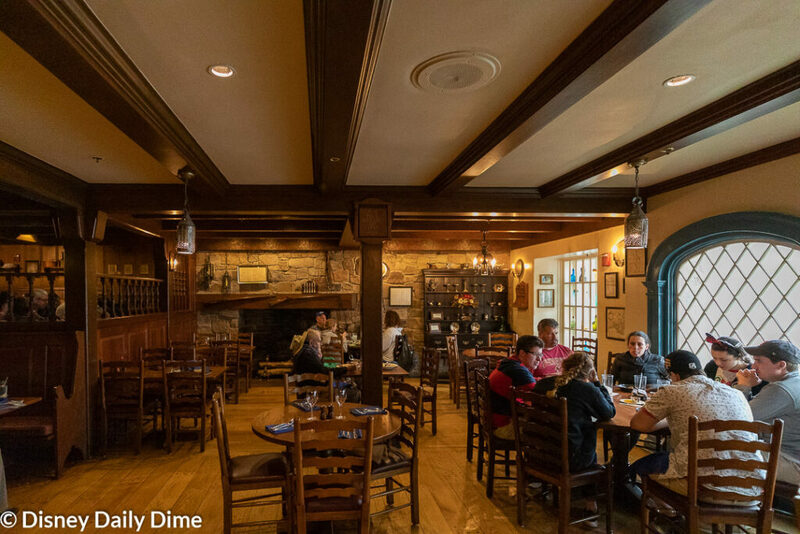 Liberty Tree Tavern lunch will run you one table service credit on the Disney Dining plan. Most entrees will cost you between $18 and $25 for lunch, which makes it not the best value for you table service credit. However, if you get the Patriots Platter the value gets better since it will run you almost $40 if you pay out of pocket. 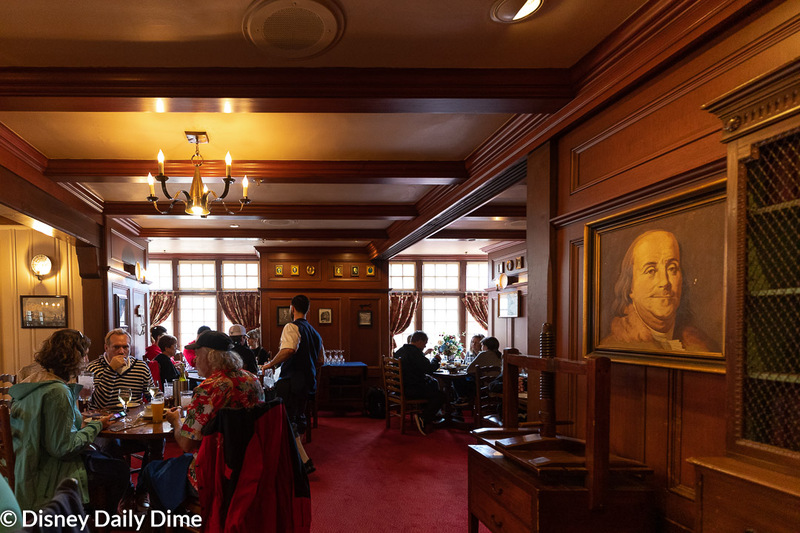 As I mentioned above, the theming of Liberty Tree Tavern is spot on what you would imagine a colonial house to look like inside (with the exception of central air and electric lights…). Stone fireplaces, wood floors, wood paneled walls and period appropriate décor and knick-knacks abound. Mike and I took the girls on a lap through the restaurant so we could point out the historical significance of each room and who the rooms pay tribute to. The restaurant staff are dressed in period attire, completing the colonial theme. When you are called to be seated at your table, your family is called by a town crier type announcement complete with a “Hear Ye Hear Ye”, your party’s last name and your home state. It is a fun bit of theming that adds to the atmosphere. Our server this day was named Doreen, and she was sweet and very engaging and helpful. She encouraged us to walk around the restaurant to take in the décor. She was excellent with the girls, carrying on conversations with them and recommending items that we may enjoy. Our server checked on us frequently without being intrusive. Sometimes I feel when the food is served family-style that the service can be great at the beginning and then drastically decrease once the food is served. This was certainly not the case here, which may also be because they do offer a regular a la carte menu for lunch too. Note that dinner is only the family-style Patriots Platter and no a la carte selections. The day we were dining here was a little on the cold side and rainy, so we were ready for some comfort food. Liberty Tree Tavern’s a la carte lunch menu offers a variety of appetizers and entrees. Some of the choices include pot roast or turkey plates, fish and chips, meatloaf, burgers and a lobster roll. Since this was going to be our “big” meal of the day, Mike and Donald both had their eye on the All You Care to Enjoy Patriot’s Platter. The meal includes the Declaration Salad to start. The Platter is then served, which contains turkey, pot roast, stuffing, mashed potatoes, and seasonal vegetables. (We were served green beans). A dish of macaroni and cheese was served separately, along with a gravy boat and individual servings of cranberry sauce. The meal also includes a choice of dessert. Anna and Elsa both chose the kids meal entrée of macaroni and cheese served with two sides of their choice. However, both girls sampled the salad and the meats on the Patriot’s Platter. They were served the same macaroni and cheese that came out with the platter. Both girls chose fruit as one of their sides and we were disappointed that the serving was very paltry and only had 5 or 6 bites of fruit. Mike and Donald both enjoyed all aspects of the meal. The salad to start was crisp and fresh, even if it was prepared in advance. The honey-shallot dressing on the salad was so delicious we asked what it was as the menu just referred to a house dressing. Anna and Elsa tried some of the salad and while they typically only enjoy ranch, they too enjoyed this sweet and tangy dressing. The turkey on the platter was a little on the dry side by itself, but with a touch of gravy it was truly much better. The turkey was flavorful and the gravy tasted more on the homemade side and not like just a canned or jarred gravy. Now the pot roast was much better than we anticipated it being. It was fork tender, juicy and full of flavor. This also passed the Anna and Elsa test as they were pretty indifferent on the turkey but ate a couple of bites of the pot roast off the platter that Mike and Donald had ordered. The guys enjoyed the pot roast so much they ordered a second helping. Everyone found the sides hearty and delicious. The mashed potatoes tasted homemade and included small chunks of potato. The macaroni and cheese was a middle of the road mac and cheese. It was higher quality than say, Easy Mac, but it wasn’t quite a top of the line three cheese mac either. 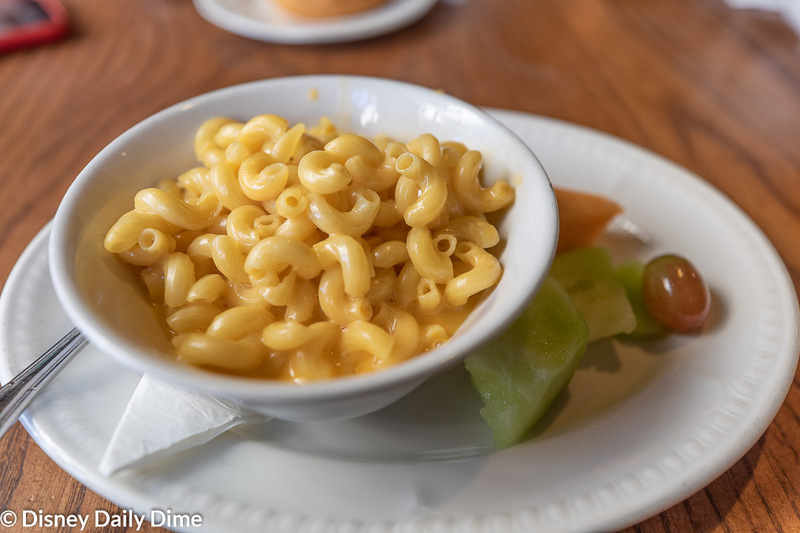 Stouffers used to sponsor the Liberty Tree Tavern and while it isn’t Stouffers macaroni and cheese anymore, this mac and cheese is comparable to that. The green beans were fresh, seasoned and cooked where they still retained a light crunch. The cranberry sauce was not the straight out of the can variety. It contained chunks of fresh fruit and definitely reminded us of a homemade cranberry sauce. I was also able to enjoy my own gluten free Patriot’s Platter. As someone who loves Thanksgiving and the traditional components of the meal, I have lamented not being able to enjoy many of my favorite sides and gravy the past couple of years since going gluten free. It nearly brought a tear to my eye to enjoy gluten free gravy and stuffing along side the turkey, mashed potatoes and green beans. I will discuss this more in my Liberty Tree Tavern Gluten Free Lunch Review. 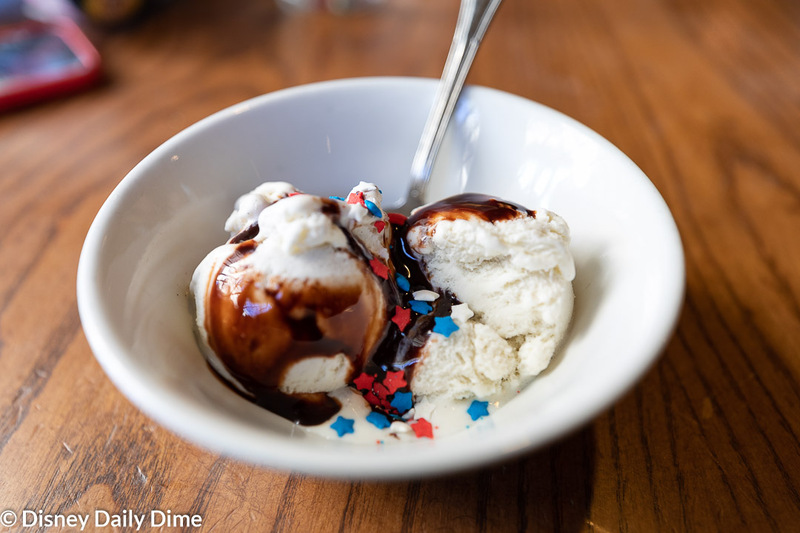 The Patriot’s Platter included a choice of dessert. 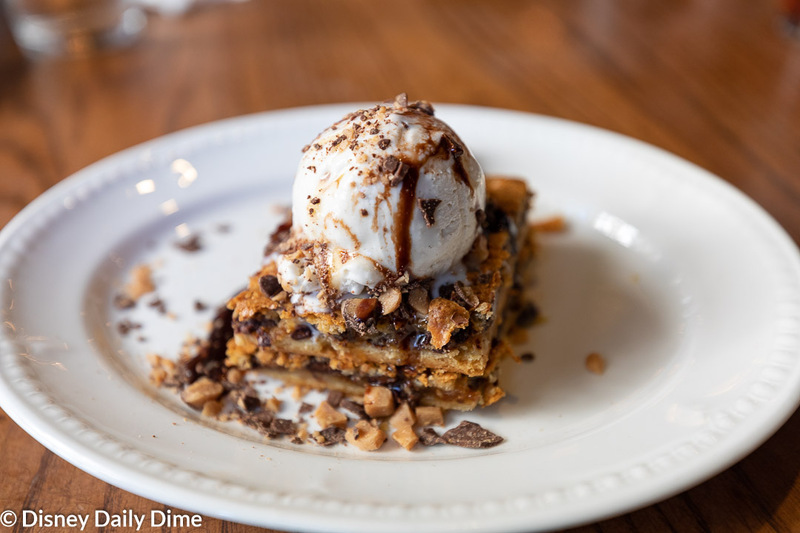 Donald chose the apple fritters, while Mike ordered the Liberty Tree Tavern’s popular Ooey Gooey Toffee Cake. 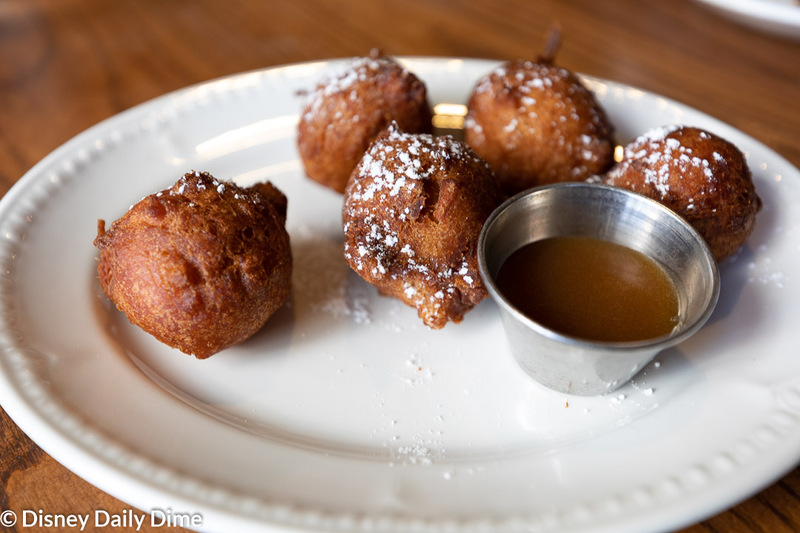 The apple fritters were similar to a cake donut hole, but battered and crunchy on the outside. They were served with a caramel dipping sauce. Donald and the taste-testing duo of Anna and Elsa all enjoyed this treat. Mike loved the Toffee Cake. He was surprised how much he liked it as he isn’t a huge toffee fan and he almost didn’t order any dessert as he was so full from lunch. He thoroughly enjoyed this sweet ending to his meal. Mike said he could have actually gone without the ice cream and just had the cake for his dessert. The girls both enjoyed ice cream sundaes which were offered as one of the side item choices on their kids’ meal. I was able to enjoy a delicious raspberry sorbet served with fresh berries. In general, when we travel we really try to take the opportunity to try different foods that we don’t normally eat at home. Sanaa is a perfect example of this. However, sometimes a meal that is warm, comforting and just like home is in order. The Liberty Tree Tavern lunch really fit this bill for us. Granted, the weather was perfect for this type of meal and I am honestly not sure if we would have enjoyed it as much in the dead heat of summer. 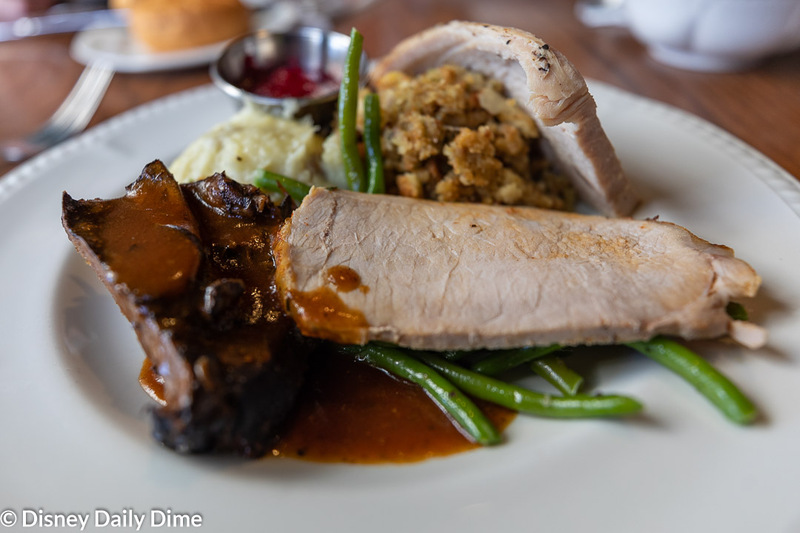 The food at Magic Kingdom is kind of underwhelming overall, so we were pleasantly surprised at the homemade quality that this meal had and that it was less like the mass-produced fare we were anticipating. This is an excellent choice for groups traveling with children, not only for the appealing food but they may also get a little history lesson in the process. Of course, that assumes they aren’t horrified that they will learn something while on vacation! With that, we’ll wrap up our Liberty Tree Tavern Lunch review. An excellent choice for a hearty, sit- down meal, with a unique atmosphere that will appeal to almost anyone. 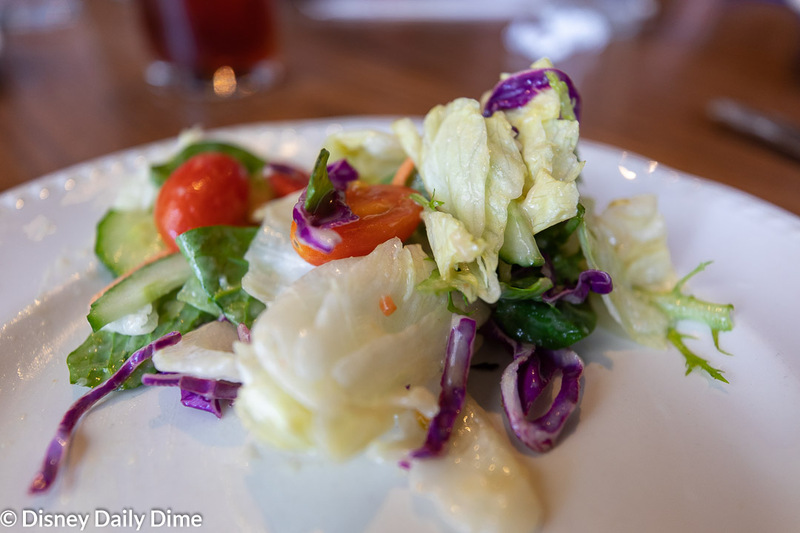 If our Liberty Tree Tavern Lunch review was helpful, or at least entertaining, please like and share this with your friends or anyone you think will find it useful. Just use the sharing buttons on the page. We always appreciate it when you share our posts, as it allows us to spread the word about our young blog and hopefully allows us to help others.